Greetings and salutations, everyone; yes, once again it is I, Mani the purebred border collie, filling in for the guy I live with, and here to bring you the latest news about our modern lifestyle. You may remember me from such posts as “The Bulb Frame”, among so many, many others. Here I am in a characteristic pose. Those Pottery Barn sheets are really soft, if you didn’t know. I’ve learned a great deal about their excellent qualities in the last couple of years. Sometimes it’s not easy to drag myself off of them to go do something. I’ve learned that from someone else who lives here. It rained last night. Not a huge amount, but enough so that the guy I live with could say that it was raining. 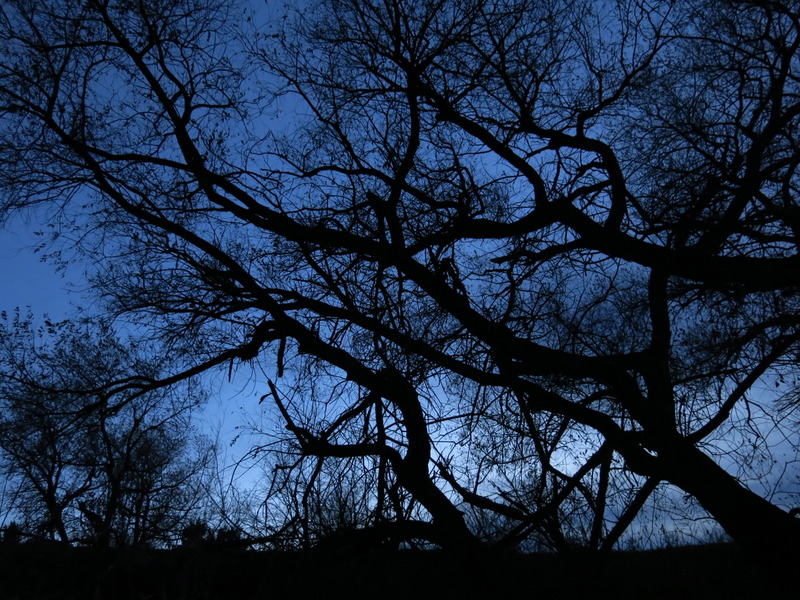 Then later, some time in the night, it got down to a little below freezing. 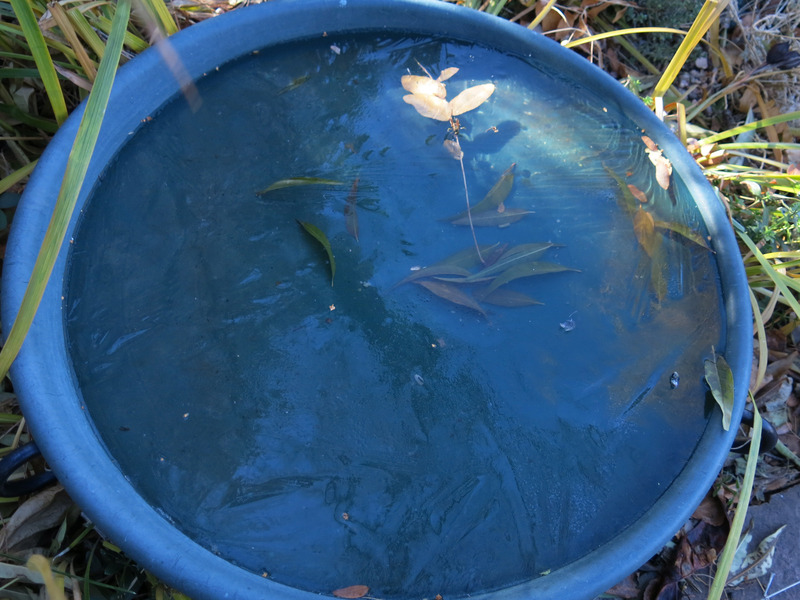 The birdbath isn’t level, as you can tell. It needs to be leveled, and then the heater needs to be set up. 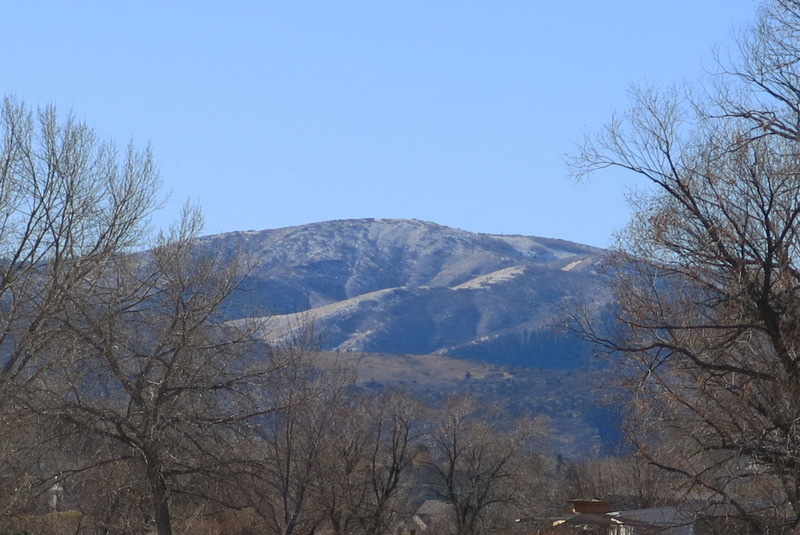 There was even some snow on the foothills. This is looking to the southwest. 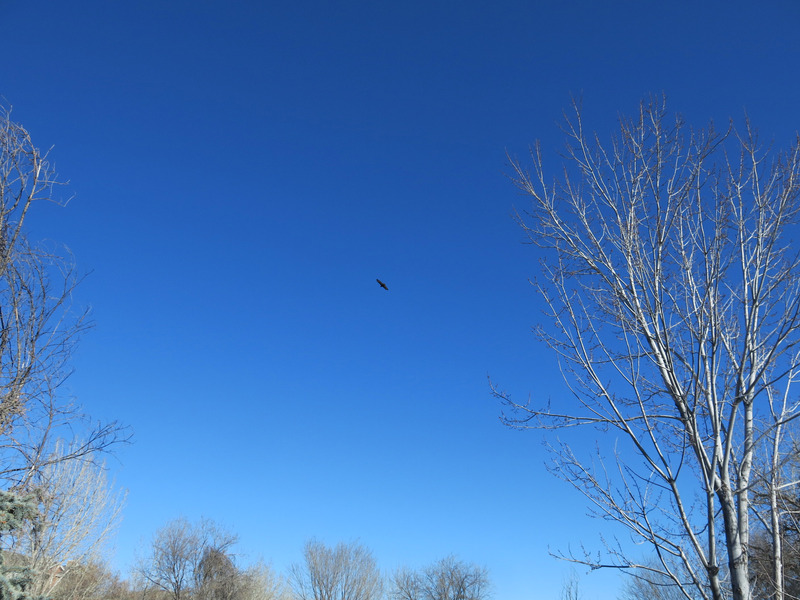 There were two hawks in the sky this morning, to the north. I think there’s only one in this picture. Anyway, a couple of other things have happened. One kind of major, but I’ll get to that in a minute. There are some crocuses still flowering, but the main action, such as it is, is in the Snowdrop Frame. There are snowdrops up. Most of these are early-flowering ones, planted here so that they could get the sun and attention (watering) that they needed. Eventually the guy I live with says he might divide them and stuff. I suppose “eventually” means “probably never”, but it is possible that he might actually do some of the things he says he’s going to. The frame is covered with translucent plastic. You can see me guarding the frame if you look really closely. Maybe this is a better angle. The frame is totally guarded, as you can see. Those green leaves behind me are Lilium candidum, and they should be green like that, right now. 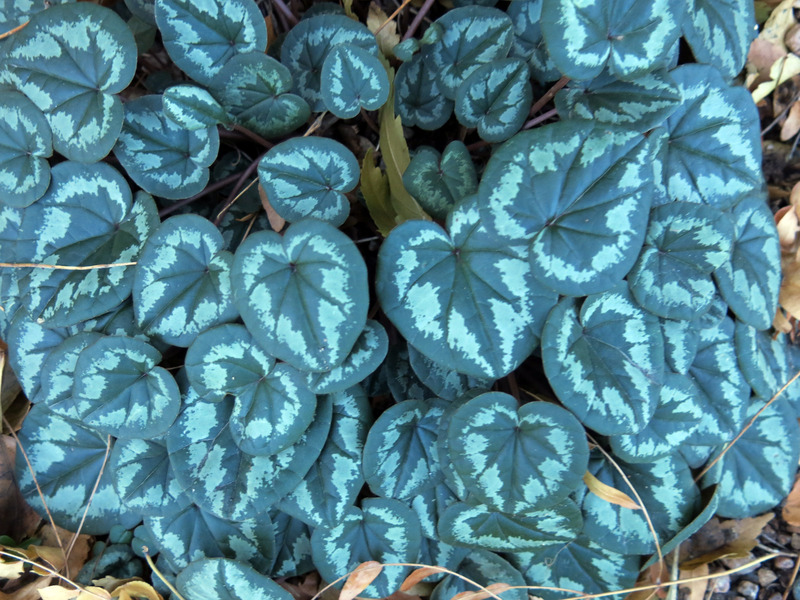 You plant this one fairly early, at the end of summer, like September, and not too deeply, and it grows these tufts of leaves which overwinter. Well, this is what happened. You see that other little “portable greenhouse” on the left? Hard not to miss it. The guy I live with was sure there was a snowdrop coming up there, an early one called Galanthus peshmenii, because he was given a couple of bulbs and planted them there. Or so he thought. Not much was happening to the green shoot coming up, so he decided, after debating for a while because usually when he decides to dig something up that’s the end of the plant, but he dug down a little, and saw roots, so he knew the bulb could be dug up. In other words it wasn’t planted very deeply. So it was dug up. The guy I live with looked at it and thought it was kind of odd for a snowdrop, and that it smelled like onions. Snowdrops don’t really smell like onions. So it probably wasn’t a snowdrop after all. It got moved into the frame anyway, just to see what would happen. When it was moved there, he noticed some other green shoots coming up near a label that said Galanthus peshmenii. One plant already flowered, so now he has no idea what’s going on. “Maybe I moved them there a while ago”, he said. Like he moves plants in his sleep. I had no idea at all. It was important to him, anyway. Now about the other thing. This is pretty major. I think the toaster is haunted. This is it, here. It has this cloth over it, because it’s always had a cloth over it. Some things around here stay the way they were for a very long time. But I don’t like the toaster. It gives me chills just to show you this. I wasn’t afraid of the toaster for a long time, and then suddenly, some time this year, I decided it was scary. Not just regular scary, but ultra scary. 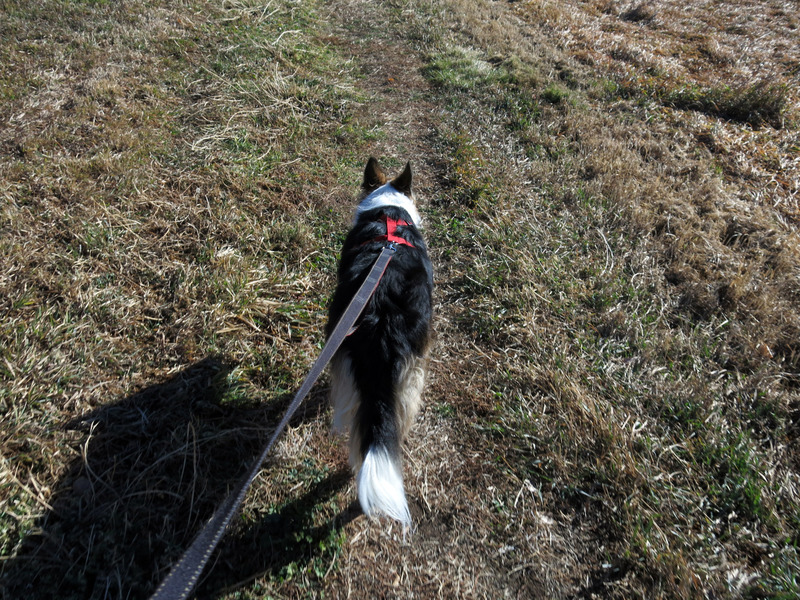 The guy I live with thought that was funny, because he said the first purebred border collie who lived here, Flurry, was afraid of the toaster, too. Like it was haunted or something. At that time it was like a model from the late nineteen-forties, probably insulated with asbestos, with a cloth-covered electrical cord. The toaster stopped working a couple of times and the guy I live with repaired it. The lady of the house loved the old toaster and making toast with it, but Flurry got so upset when toast was made that the practice was discontinued. Flurry lived to be seventeen so there was a long period of no toast-making in the house. The old toaster finally broke, and a new one was purchased. The new one didn’t have the “character” of the old one (or the asbestos) but eventually it became part of the household and toast was made regularly again. If it could be toasted, it was. 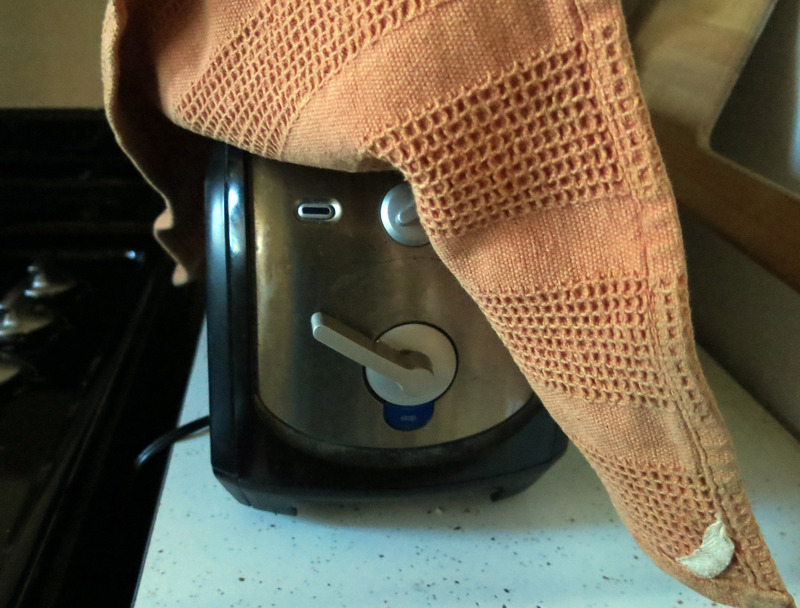 But now ….well, the guy I live with doesn’t make toast very often, so I’ll just have to be super alert. 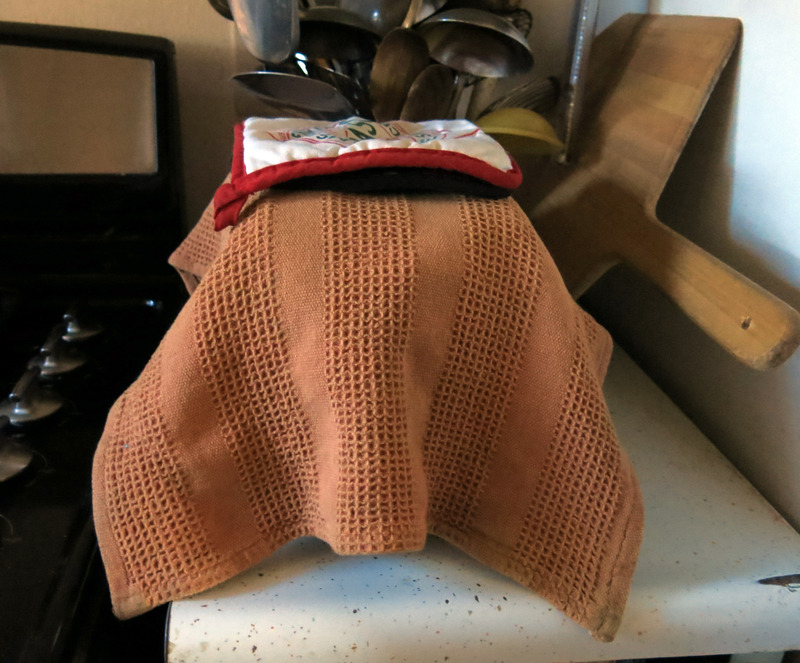 Any other news I might have pales in comparison to the scary toaster, but we haven’t seen the muskrat in a few days. We looked. You’re supposed to be able to see them around sunset, which is when this picture was taken. 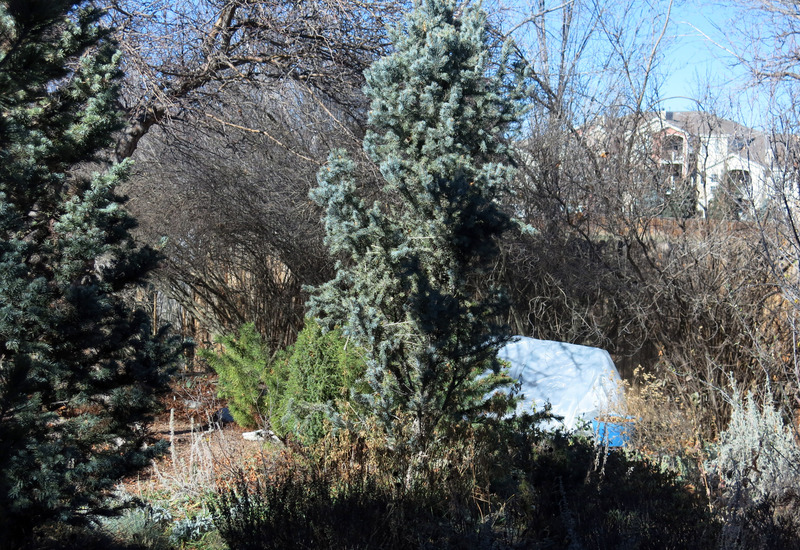 The guy I live with said it was probably working on its fort, for the winter. It’s important to have a fort. 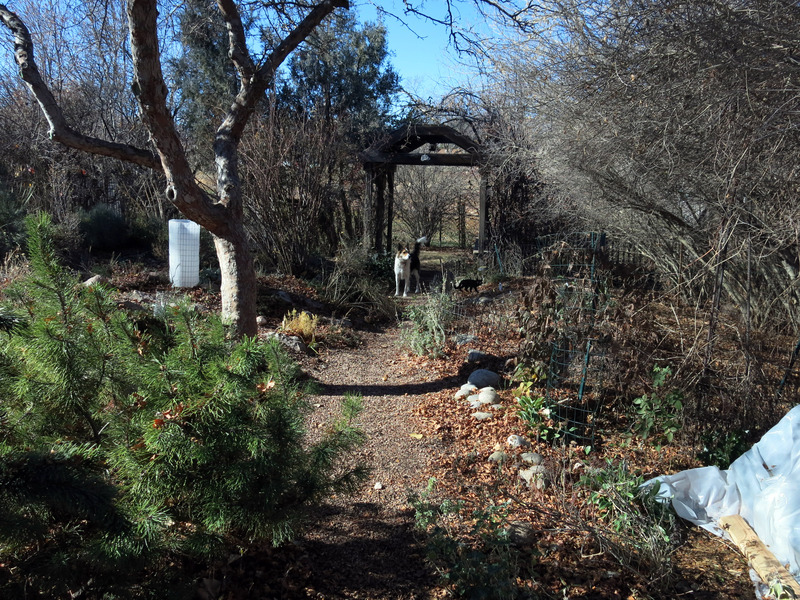 And there are things to look at in the garden. Maybe not incredibly interesting things, but things, nonetheless. 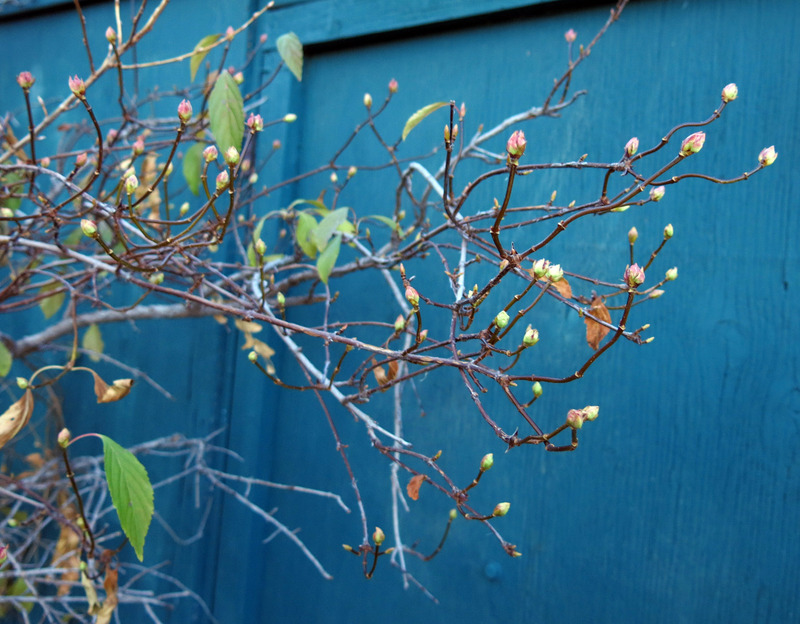 Viburnum farreri has buds now. The guy I live with says the buds are “focus-proof”. Just because he can’t take a good picture of the buds, I’d say. And so does Daphne blagayana. This daphne was found by Count Blagay on his estate in Slovenia in the early nineteenth century. It’s been here for a while now. It kind of lies flat on the ground, the way it should. Reginald Farrer, after whom the viburnum was named, said, in The English Rock Garden, that you were supposed to pile stones (preferably limestone) on the branches because that helped it grow. 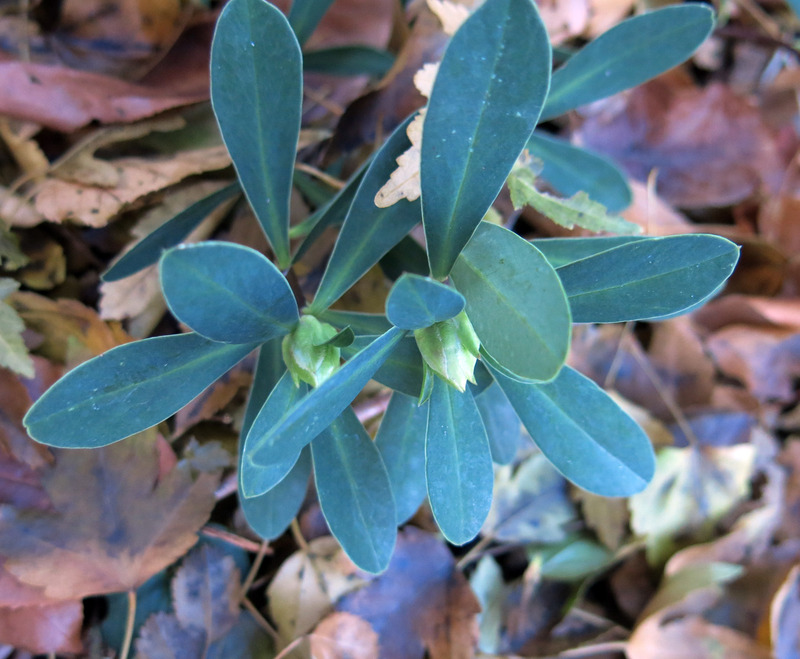 We haven’t done that yet, and so the guy I live with says the daphne will probably pass away, but if it does, it will make an interesting, if short, story. 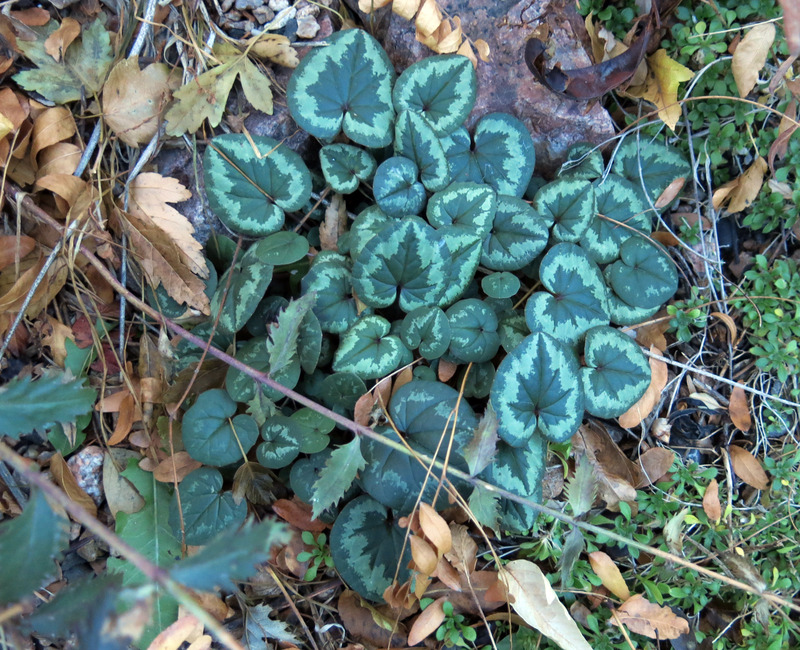 Then there are bunches of cyclamen. 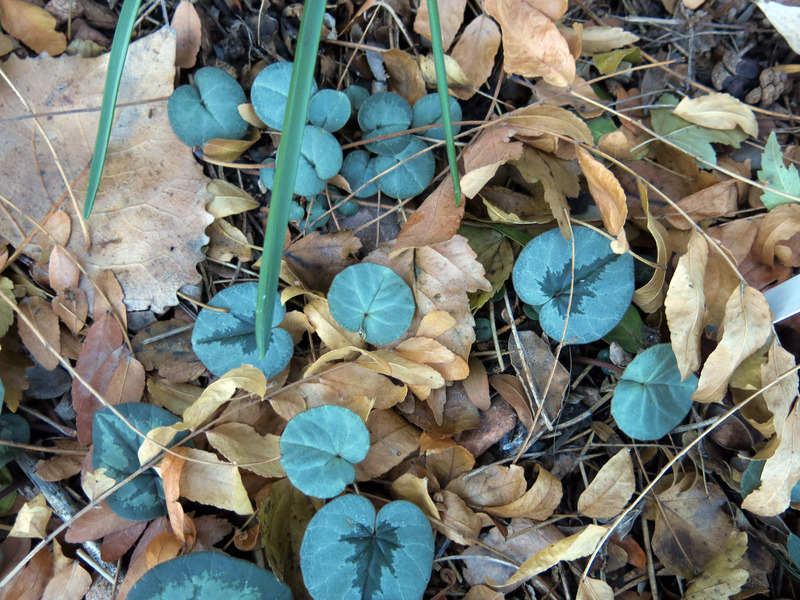 These are Cyclamen coum. They all came from the guy I live with’s late friend in New York, and have seeded around like crazy in the last quarter century. “Show the willow pictures!” I was getting to them. 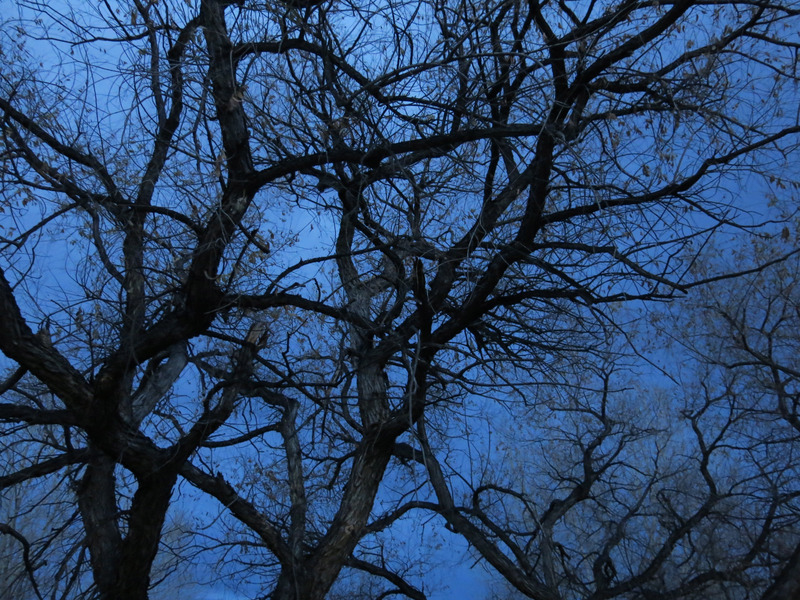 The guy I live with has been taking willow pictures, at dusk. So here they are. We think this is Salix amygaloides, the peach-leaf willow. 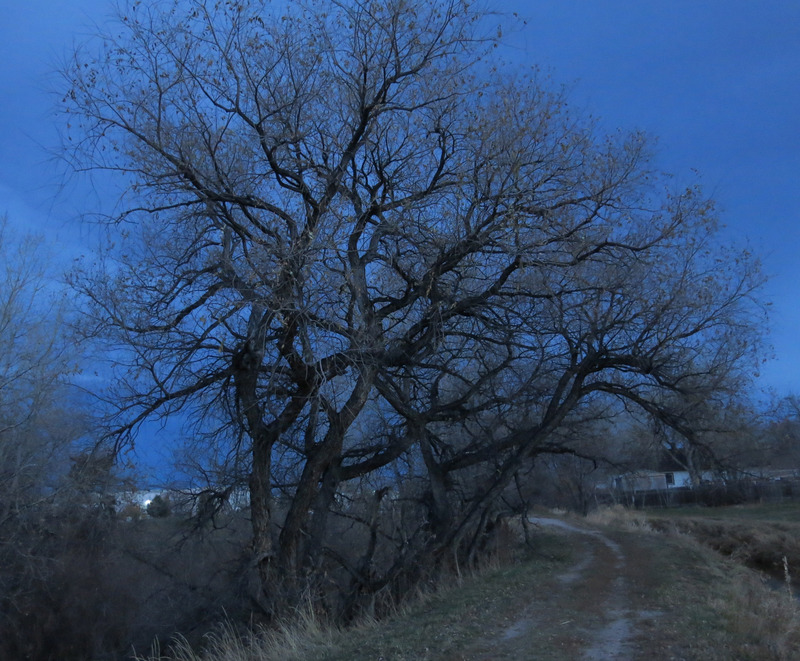 We haven’t even walked down to the Big Scary Willow yet. I guess we might do that later. What if the toaster got to the muskrats!? We can’t think of things like that. The toaster is, I hope, stationary. 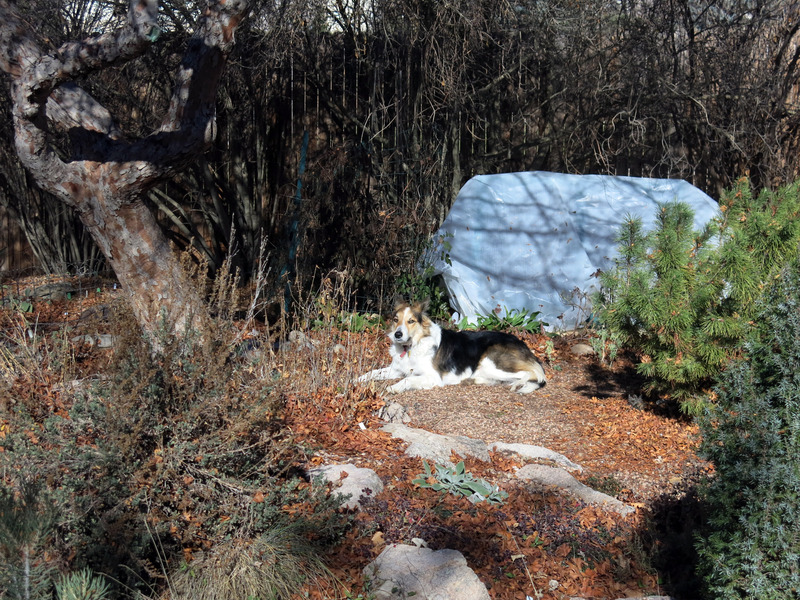 What an important role you have there Mani, what with guarding the frame and observing the gardening. No wonder you are tired and need lots of sleep. Thanks, I agree. Though the guy I live with says he needs even more sleep. Which is weird for such an old person …. Wow, you do look like a wild boar — maybe throw that shadow at the haunted toaster. I will go back to check your previous shadow prior to regular grooming. 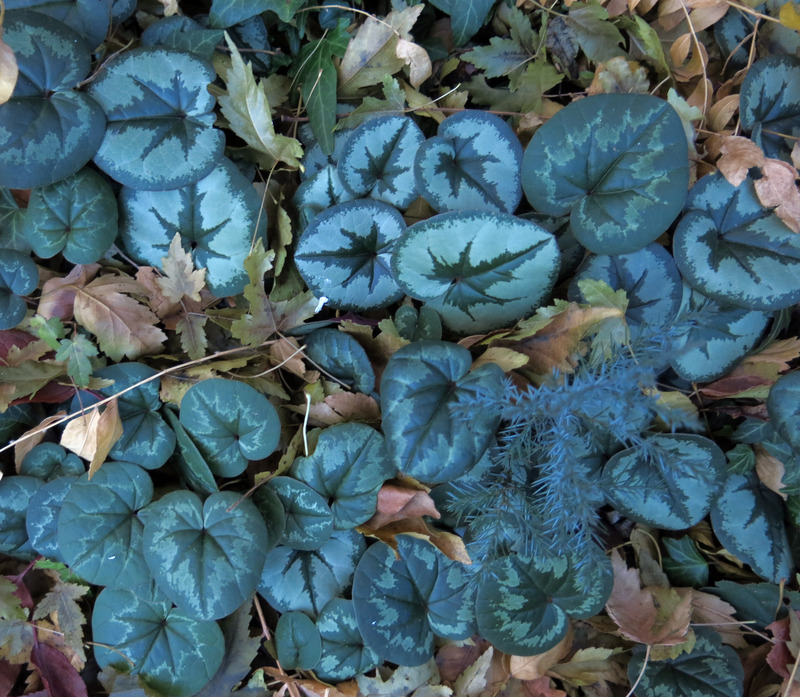 You do entertain us, dear Mani, with the wonderful photos of cyclamen leaves, blue sky and muskrat-empty canals. The willow photos are outstanding. Our 2018 calendar of Michael Kenna photos has arrived – we used to collect actual photos back in the day when we could afford him – and two tree photos are in there. Being Kenna trees, they’re outstanding. So your guy’s photos would fit right in. Think of it: Mani Doing the Days, a calendar of your very own. We’ve got 21 of Kenna’s 22 – and I’m eager to start collecting yours. Thanks; the guy I live with says my shadow can make me look ultra-fierce. I sometimes need that ultra-fierce look when unleashed dogs approach me. (The guy I live with picks me up when that happens, so I’m safe.) 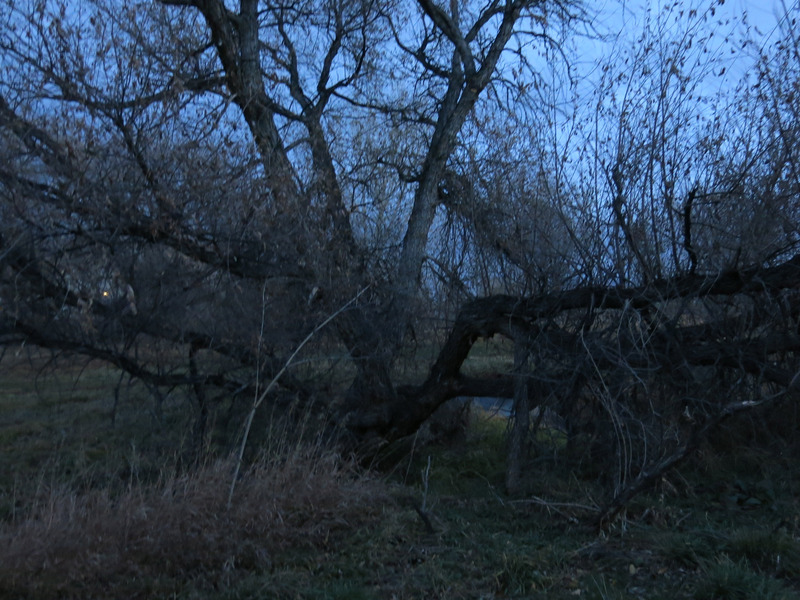 The willows are pretty photogenic, aren’t they? They get broken by snow and wind all the time. And sometimes they just fall over. They might also be crack willows, Salix fragilis; the guy I live with forgot to check the leaves this summer, once again. 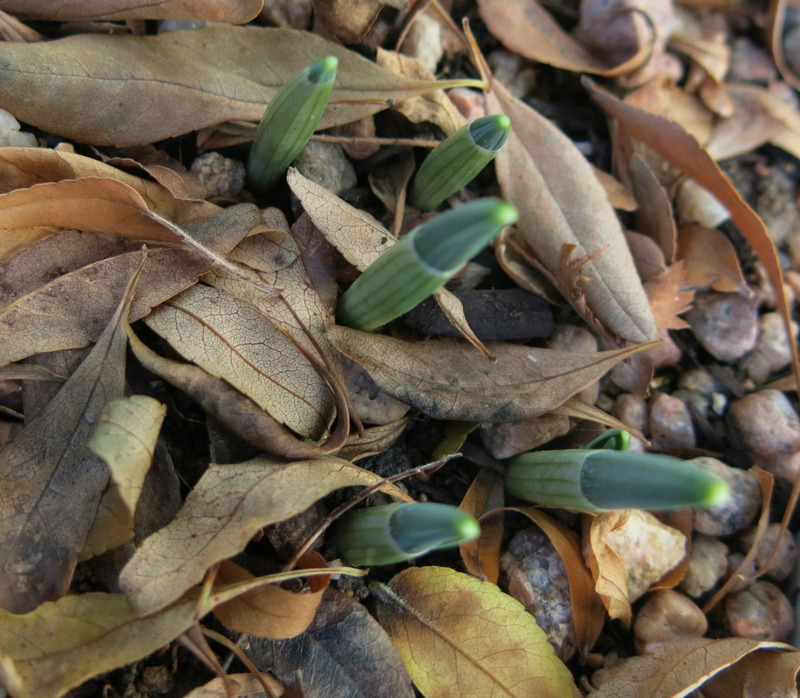 Oh, do want to say I enjoy the conceit of snowdrop flowers emerging at the same time as snow on the mountains. Rather elegant, don’t you think? The guy I live with said the snowdrops would, or might, have flowered earlier if there had been more rain…..
Wow, and i never ever thought I would be saying this, but I’m glad I don’t live with you, Mani. Because I love toast. 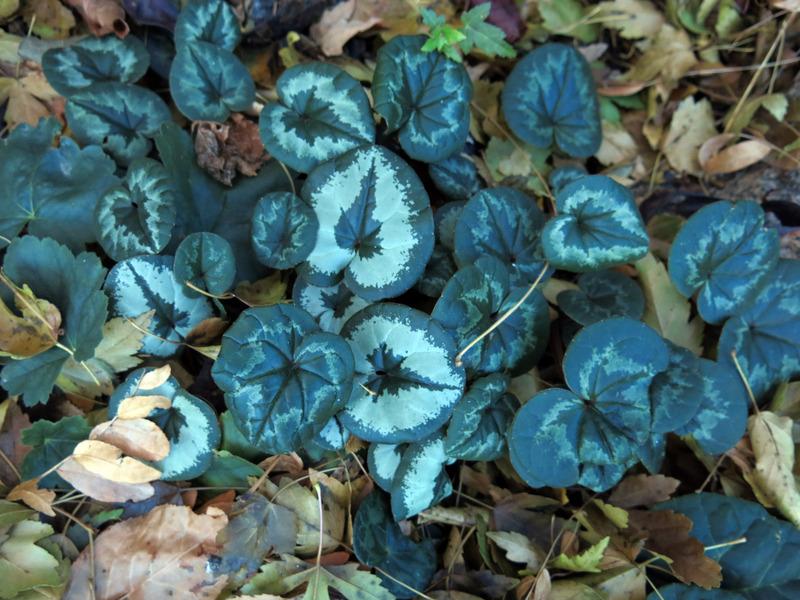 Those cyclamen leaves are so wonderful. I particularly like the silvery Christmas tree ones. Are you offering prints of the willow pictures? I’d like to place my order for the third one, maybe with the buildings airbrushed or photoshopped away. 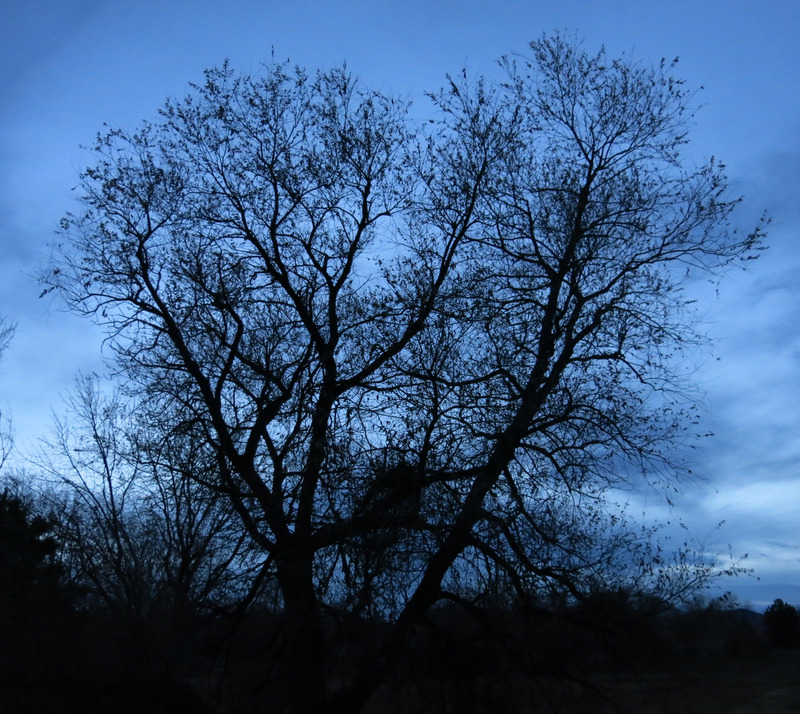 The tree itself against the twilight is just perfect. 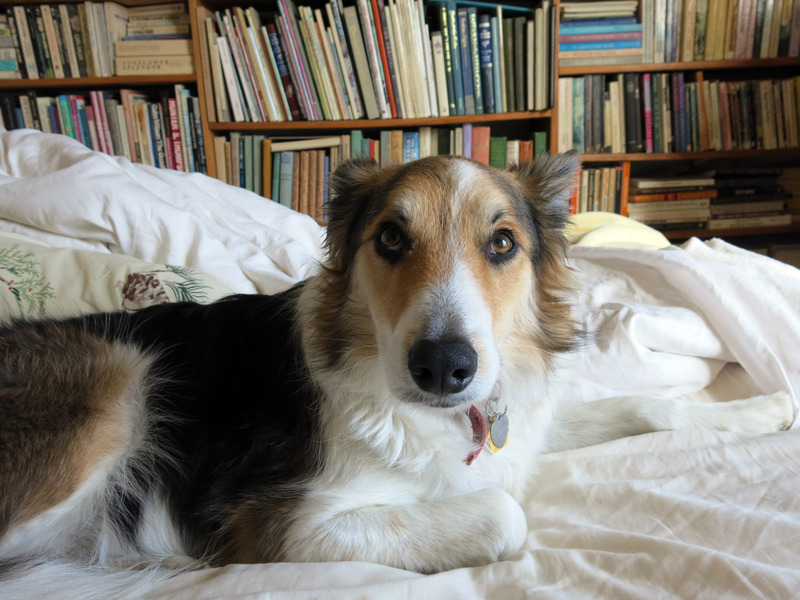 The guy I live with told me that Slipper, a purebred border collie who lived here before me, really liked toast, but only if it had butter and jelly on it. Especially if the butter had been put on when it was soft, and so kind of soaked into the toast. (One of the things that irks him is not having soft butter to spread on toast.) I admit this sounds interesting. I don’t think the willow pictures would make good prints because they were taken with the point-and-shoot and are small files. The building on the right is an old farmhouse. The one on the left is an office building, kind of far away; we often walk by that. 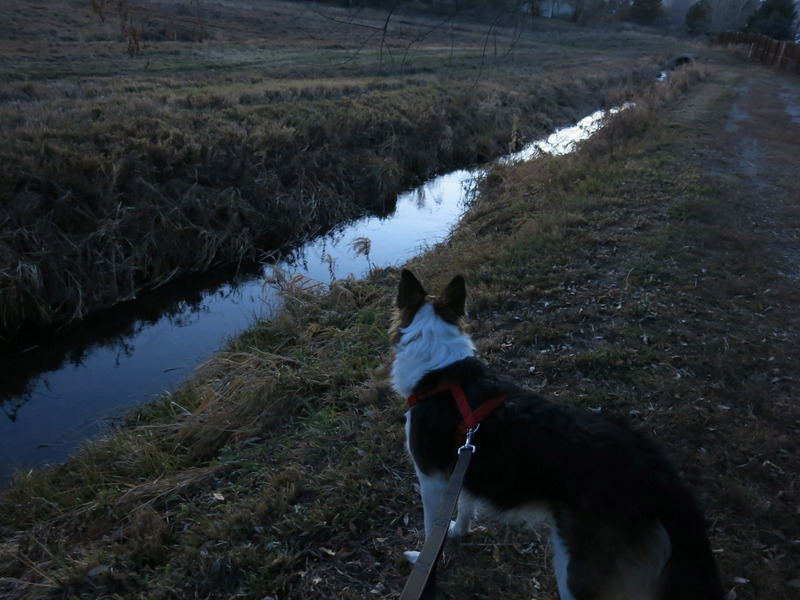 We generally go down the canal road, then veer off to the right (you can’t see that) following the canal, then go around the buildings, way down the street, and come back on a path to the left and behind the tree.